This is a spell is a home blessing. This spell is to be given to a friend on the day of their move. This spell is not actually a spell per say but more of a working. It is said that the best type of gift for this type of working would be something from nature. A lot of people give wooden items, herbs, plants etc. Another home blessing for your to check out: Windchime Home Blessing. Do your usual cleansing and meditation and cast your circle. Anoint your candle with the blessing oil. Charge the candle with your intention. Place the candle on the altar. Spend sometime meditating on the flame. Take the blessing oil and place 2 drops on each hand starting with your power hand. Rub your hands together to create energy. Feel the protective energy building in your hands. When you feel ready take the incense in your power hand and visualize the energy leaving you hand and infusing with the incense. I hope you find happiness and joy in your new home; bringing you endless smiles, memories, and protection. Once the ink on the paper has dried pass the paper through the smoke of the incense three times. Place the note on your gift and place your gift onto you altar. Spend sometime meditating quietly. Thank the Goddess and close your circle. So mote it be. Spells like this are wonderful because in the act of selfless giving the three fold law is working its best. Coming from a place of pure love is the best way to do magick and one of the easiest ways to make fast Karma or to change the luck in your life is to give selflessly to others. This spell is unique and requires simple, easy to get supplies. 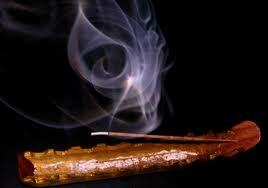 You can substitute the Nine Woods incense with something like sage, or sandalwood. If at all possible do this spell on the night of the new moon to signify new beginnings. You can also do this home blessing spell for your own home with chanting instead of writing the note. You can write a chant/blessing and say it aloud while burning the Nine Woods or Sage incense.